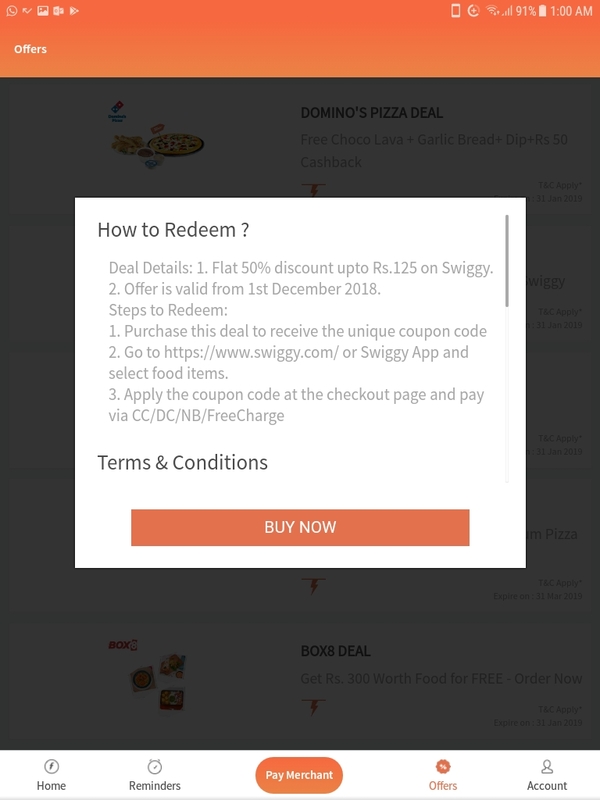 / Swiggy New User Deal Rs200.. 50% Off Upto Rs125 + 25% Cashback Upto 75..
Swiggy new user deal rs200.. 50% off upto rs125 + 25% cashback upto 75..
Deal wiki is WRONG as this not being a better offer! Spend rs1 and get rs125 off..
Use ORDER50 and get 50% off for first 5 deals upto 100 + amazon pay cashback offer for 75..
Its a different offer.. I suppose its a better offer if you plan to order a lot but amazon cashback goes to 50 and 25 and none.. And I already took the amazon offer yesterday.. Does the Order50 get applied automatically? I selected it before and never saw it after the first time. Amazon has 30% 175 offer for 75/50/50, I got 75 yesterday so it is valid.. I dont know off the 100.. But amazon has them in the middle sometimes.. This is a freecharge offer.. Since I already spent my amazon money but have freecharge to use..
You know if I buy the code, it will work in old swiggy account? Dont feel like having 20 different accounts..
Isn’t this first order through freecharge?? Its an old offer which I took then but amazon came out with their 150 off so never used this and it expired.. Now its back on again.. Already got mastercard 100 off and cred 100 off so if I can use this for 125 off then even without the 75 cash back it is worth it..
New user mean freecharge or swiggy? Deal wiki is WRONG as this not being a better offer! Spend rs1 and get rs125 off.. And this is for old users as well as the last screen I posted accepting cards as payments..There is no FRAUD to commit to get this making second accounts and duplicates.. Title is saying New user deal then how it can be applicable to old users? This is applicable to once per user (new). New users get additional rs75 cash back.. But the coupon gives 125 discount. It showed up in my old account as well. Without the rs75 off message..
And since when does rs100 off become better than rs 125 off? Let’s discuss two cases mathematically. 155.25 off on 250 effectively for the first order only. Now, decide by yourself Which deal is better? U missed 30% cashback through Amazon pay. What about the rs75 cash back on FC? And lets use rs300 since MY orders are usually 700 or higher..
What about the rs75 cash back on FC? 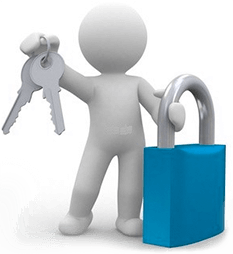 And by your definition paytm 2700 offer would be the best to use.. Anyway, I would say FC offer is more beneficial as we don’t need to worry about utilisation of cashback and also don’t need to make new swiggy accounts everytime. What ever the reason I bought the coupons in both accounts as it is beneficial to me and thats what counts.. In one I would get 125+75 and in the other I would get 125+what ever offer like amazon 50.. Since I already have 100 off with CRED and Mastercard.. I dont buy from 5 different places for 100 or 200 each so I prefer to just use this..
Bro fc coupon is not applicable for old users. I just tried it recently. It’s not working. Old users of Freecharge or Swiggy? yes you are right, it says for new users.. old freecharge and new swiggy.. Then why is FC offering it to old users? But in any case order50 is also for new users.. and to use it with credit cards and net banking? I made those 2 cases based on your assumption that FC offer is working for old user. Edited that comment now. 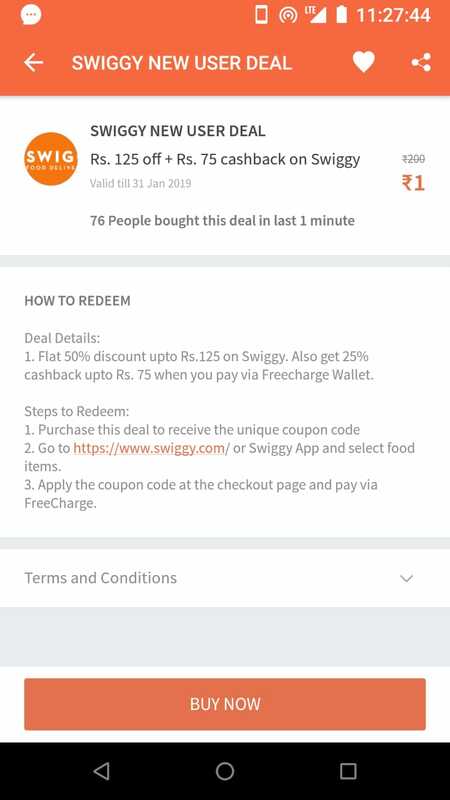 125 off coupon is not working for me.I am old swiggy user. It wasnt my assumption, the offer showed up in my new phone and after an hour in my old phone with different terms ie no rs75CB and to use it with CC and netbanking.. But it still makes no difference.. You need new swiggy account in either case. And for me 125 off is better than 100 off.. even without the 75CB for one of the accounts. I already have enough 100 off coupons. 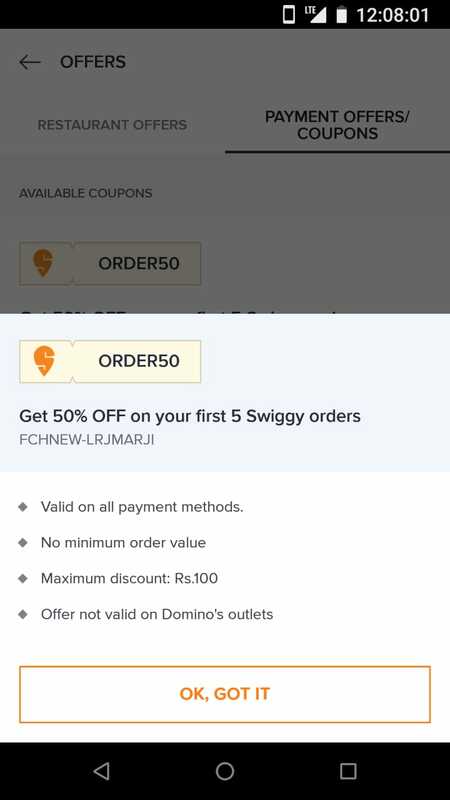 As 200 off on 300 is better than 175/150 off on 300.. And people fight here for 1 on 10..
Guys,is swiggy still providing order50 or any other promocode for new signup’s, which can be used 5 times?